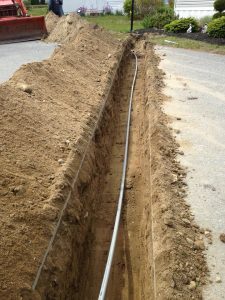 Morrill Electric installs underground utility cables and wiring for electricity and media throughout the North Shore and Merrimack Valley region. We build underground electrical systems of any size and voltage to meet our industrial or commercial client’s needs. We also ensure that each project strictly adheres to the National Electrical Code, state guidelines, and made to endure the harshest of New England climates. Our professional electricians will first work with you and the town/city and state (if applicable) in order to obtain working permits. While we wait on the permits, we will work with you to design a blueprint for the electrical wires. This process includes surveying the area, analyzing existing underground wiring schematics and determining if there needs to be any other additional landscaping work done from other third parties, such as drainage systems. There are varying depth options depending on what type of utility wires and cables you need installed, so these depths will also need to be taken into account. Morrill Electric is capable of digging through sandy soil as well as rock or clay-based soil; we are always prepared for whatever underground utility installation project you may need. Our professional electricians can provide 6 in., 12 in., 18 in., and 24 in. deep to install wires while utilizing PVC conduit for deeper digs, UF-B cables, and waterproof THWN-2 cables. We strive to also help you reduce your project costs by installing both gas and electrical lines in the same trench. Depending on trench depth, telephone and cable wiring can also be included within the same dig. Installing underground cables not only improves your home’s curb appeal, but also reduces maintenance costs in the long run. In the Massachusetts area, we are subject to storms and heavy amounts of snow that can cause wires and cables to detach from their utility poles, causing fires and other hazards. Morrill Electric has installed hundreds of utility wires across the Merrimack Valley and the North Shore and our goal is to ensure that the project is completed on time, within the estimated budget, and with precision and care. Our goal is to make sure that the project site is clean and organized and we will always do our best to ensure that the backfill is properly replaced after the wiring is installed. Have questions about our underground cable installation services? Contact us or request a free project estimate from Morrill Electric today.